Decompression is achieved by using a specific combination of force of pull, angle in degree of pull and varying time in order to create a negative pressure inside the discs of the spinal cord. This reversal of pressure creates an vacuum inside the disc that helps to draw in bulging discs and extruded disc material back into place, taking pressure off pinched or irritated nerves. Spinal experts believe that nutrients, oxygen, and fluids are drawn into the disc to create a revitalized environment conducive to healing for both herniated and degenerated discs. Based on the patient’s body weight, tolerance, level of severity, and duration of symptoms your spinal decompression specialist will determine a specific treatment plan based on your individual needs. This will help to ensure the best most long lasting results. 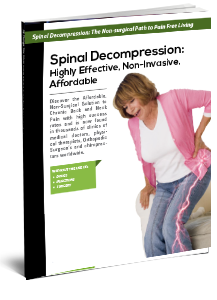 Who doesn’t qualify for spinal decompression therapy?